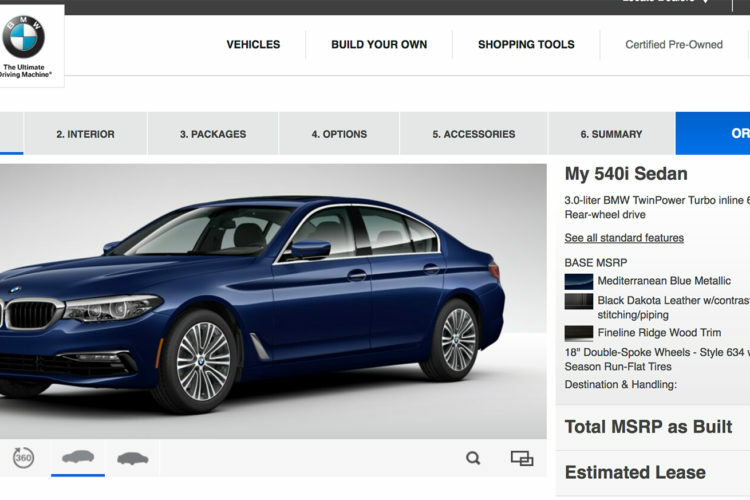 The online configurator for the new 2017 BMW 5 Series is now available on www.bmwusa.com. As always, the configurator gives the ability to full customize your BMW, based on the features and options offered by the specific market, in this case, US. First, we get to see the four model variants of the 5 Series that BMW will launching first, there will be the BMW 530i and 540i, with both cars having an xDrive all-wheel drive variant. The 530i will get BMW’s B48 2.0 liter turbocharged four-cylinder engine and the 540i will get the B58 3.0 liter turbocharged six-cylinder engine. There are three new color options for the upcoming 5er, Dark Graphite Metallic, Atlas Cedar Metallic and Bluestone Metallic. For the 530i, the same two SensaTec seating colors, Canberra Beige and Black. Overall, the color palette for the BMW 5 Series G30 includes thirteen paint finishes, the wheel program offers a variety of designs and diameters ranging from 17 to 20 inches. In the course of the year 2017, eight BMW Individual paintworks will be introduced, including two matte frozen variants. As for real leather options, both the 530i and 540i will have Dakota and Nappa leather options to choose from, with two new Dakota leather colors, Cognac and Night Blue. All real leather options have contrast stitching. There is also your typical suite of BMW packages, like the M Sport package and Technology package. There are a couple of new options that are interesting, though. One of them being Gesture Control, which seems to be a standalone option. That’s interesting that it isn’t standard and, frankly, kind of refreshing. The G30’s new Integral Active Steering (rear-wheel steering) is also available as a standalone option and doesn’t seem to be featured in any packages. The Bowers & Wilkins Diamond Surround Sound is offered as well. The 2017 BMW 530i is available for $51,200, the 530i xDrive model for $53,500, the BMW 540i costs $56,450 and the BMW 540i xDrive model sells for $58,750, plus $995 Destination and Handling.